In the spirit of the upcoming 2014 Brazil World Cup, I've got a new L'Occitane Brazilian sourced and influenced body care product that's fantastic. It combines amazing fragrance with lots of moisture - perfect for the upcoming beach/pool days ahead! For those of you who have never heard of Jenipapo, it's a Brazilian citrus fruit tree. This limited edition line uses it's extract in the products. 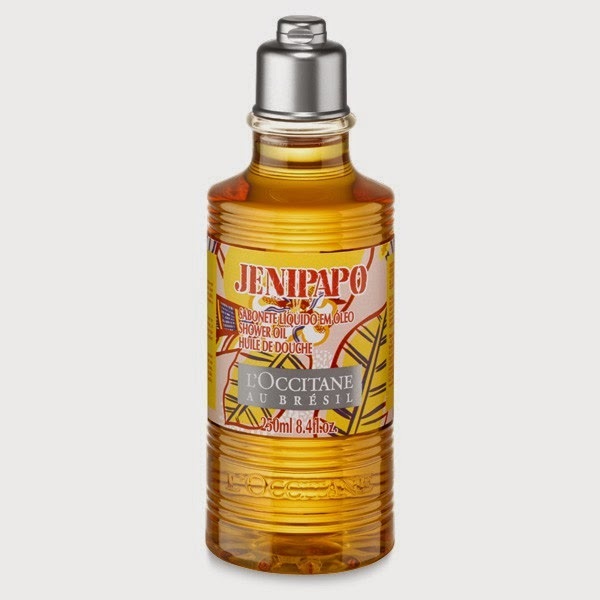 The L'Occitane au Brésil Jenipapo Shower Oil has a very unique and distinctive fragrance that I would describe as: melon, pineapple and orange with white flower and very green, leafy notes note blended in. I liked it because it was not "Island cocktail drink" fruity, but did give me a sense of summer, beach time and the subtle sweetness associated with many sun protection creams. Because of the oil formula, the shower oil is low sudsing and turns into a milky foam, but I still felt that it cleansed thoroughly. The best feature was the lovely moisture that was left behind while applying it and even after rinsing. The oil rinsed cleanly and left my skin smooth with a sheen - but without feeling too oily or gummy. If you have normal/slightly dry skin this will be all you'll need in the way of moisture post shower - so it's also a time saver. The Jenipapo line also includes: Jenipapo Oil Roll On, Face Veil SPF 30, Protecting Body Oil SPF 15 , Protecting Body Jelly Milk SPF 20 and Lip Balm SPF 25.